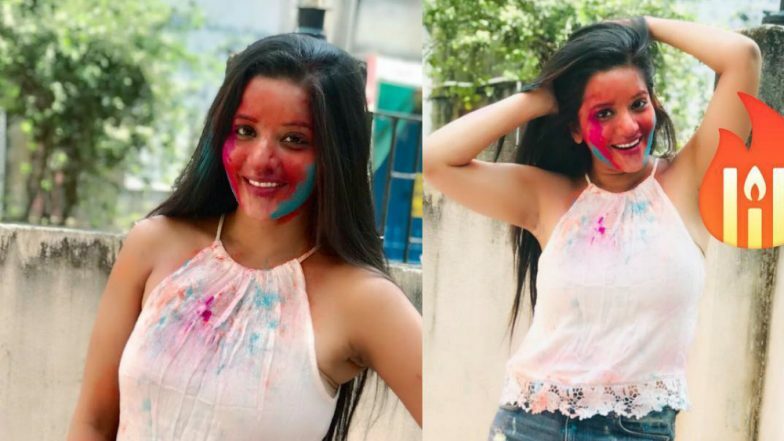 Bhojpuri actress Monalisa aka Antara Biswas wished her fans and well-wishers a Happy Holi 2019 on Thursday. The 36-year-old took to her Instagram account to extend Holi greetings to everyone out there. Monalisa shared a sultry collage of her hot photos to wish on the festivity day. This post would bring a big smile on all those Monalisa fans who have been dancing to her hit Bhojpuri Holi songs on the spring festival. Holi 2019 Bhojpuri Songs: Amrapali Dubey, Nirahua, Akshara Singh, Pawan Singh & Others Present the Most Colourful Holi Videos & Songs Jukebox. The former Bigg Boss contestant who enjoys a vast fan following especially in Uttar Pradesh and Bihar made sure to treat her fans well. In her Holi 2019 post, Monalisa shared a couple of pics in which she is wearing denim shorts with white halter-neck top. With gulal (coloured powders) on her face, the Nazar actress wows with her jaw-dropping postures. Watch Video of Monalisa Dancing on "Balam Pichkari"
You can also watch Monalisa’s popular Holi song in Bhojpuri, which co-starred Pawan Singh. The song is titled “Jab se Chadhal Ba Phagunwa” from the movie Kare La Kamaal Dharti Ke Laal. Apart from being one of the most sought-after actresses in the Bhojpuri film industry, Monalisa has also become quite a rage on social media. Especially, after her appearance on the reality television show, Bigg Boss hosted by Bollywood superstar Salman Khan. In fact, Monalisa got an opportunity to marry the love of her life, Bhojpuri actor Vikrant Singh Rajpoot in the Bigg Boss house as well in 2017.